Free consultation and estimates for LG AC and Mitsbishi Ductless systems in the Greater Boston area. Quiet Operation - LG utilizes a Skew Fan, BLDC Fan Motor, and Low Vibration Compressor, all of which are unique to LG and designed specifically to reduce operating noise. Improved Air Quality - Self Cleaning Indoor Coils eliminates unwanted mold and odors, while Micro Dust Filters collect microscopic substances like pollen and fine dust. Swirl Wind – Four-way controlled louvers and fan speed create a stronger, wider air flow and reduce temperature stratification. Connect up to 8 indoor units to 1 outdoor unit! Saving energy and Money! The Artcool series from LG is a unique way to disguise an indoor unit inside your home or office. 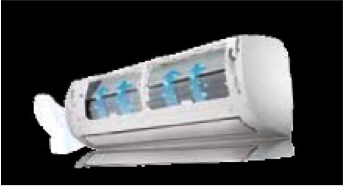 This unit also allows for more dimensions to the available airflow directions out of the unit for increased comfort.